MMT TV Ep 3 - Q&A Time! 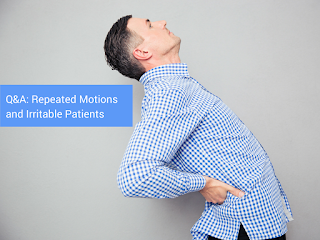 Repeated Motions and the Irritable Patient? A reader recently emailed an often asked question at Modern Manual Therapy Seminars as well as social media. "I have a MDT related question that I've heard other people ask and I thought might make an interesting piece. In patients who are more irritable (assuming it's a mechanical pain not an inflammatory pain) how do you go about using an MDT assessment while avoiding flaring up a patient? A concern that I've heard some clinicians voice is that they are afraid of flaring someone up using that assessment and having the patient not come back." I shot my answer on facebook live yesterday and I'm posting it here today. If you are actively listening, and the patient is very irritable, you should probably jump right to motions and positions that you think are going to alleviate their complaints. This may involve getting them NWB, particularly if they can't even remain seated upright as you're taking the history. Don't be afraid to let someone give you a history lying prone, supine or whatever position makes them comfortable. For a review on repeated motions and the Stop Light Rule check out this older video. A longer form video on positions of relief and relieving acutely painful and highly irritable lumbar pain will be up soon on MMT Premium.